In ministering as a Catholic priest, I sometimes get the impression that Catholics are more interested in the minimum than the maximum. What I mean is that too many Catholics seem to have heard that what is required to be a good Catholic is to go to Mass once a week and confession once a year. That’s it. Therefore, they do their duty. They check the boxes. They complete the test. They reckon they’ve done just enough to stay out of hell, that God will forgive them the rest, and they’ll coast into heaven having done what’s required. They seem, to me, like the high-school kid who was told by his teacher that his term paper needed to be five pages long with footnotes, so he turns in a mediocre effort that is five pages of mush with a few footnotes. This isn’t what a term paper is for. The term paper is a set part of the coursework so the student will not just learn how to write a five-page paper, but also learn something in the process. The term paper was a means to an end. It was not an end in itself. So it is with the practice of the Catholic faith. The rules and regulations of the Catholic faith — going to Mass each Sunday and confession once a year, the precepts of the Church and the Ten Commandments — these strictures and structures are a means to an end, not an end in themselves. They are the rules for the game of sainthood. They are the map for the journey. The game and the journey are far greater. The destination of the journey and the goal of the game is sanctity. To put it plainly: All of us are supposed to become saints. Once we have entered into the body of Christ through baptism, our destiny is total sanctity. In the Eastern Church, they call this theosis. It means becoming transformed into the full image of Christ. In St. Paul’s words to the Ephesians, it means “growing up into the full humanity of Jesus.” A saint is not simply a person who is more pious than anyone else. A saint is a person who has become more himself than anyone else. A saint is an ordinary person who has been made complete and whole and has become the fully alive person God created him to be. God has much greater things prepared for us than we can ever dare to hope or imagine. He wants nothing less than our total transformation. He created us to be shining stars in the heavens — brilliant examples of his complete, creative love. He wants us to enjoy the fullness of life in Christ, and many seem content with just getting by. 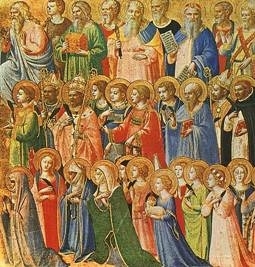 One of the reasons we celebrate All Saints’ Day and All Souls’ Day one day after the other is a reminder that all souls are called to be saints. We pray for the repose of the souls of our loved ones on All Souls’ Day, but why do we do this? Saying that we pray “for their repose” makes it sounds passive. Are we simply praying that they will rest in peace? There is more to it than that. We are also praying that God will continue his work of grace in their lives and bring them to the full state of holiness and sanctity for which they were created. Purgatory is not simply a place of rest. When we die, if we are not in mortal sin, we do not simply go to a retirement home in the sky. Purgatory is not a place of hammocks on the beach, where we can finally put up our feet and have a well-deserved rest. Purgatory is the place where we finish the work we have left undone on this earth. In purgatory, our remaining weakness, cowardice, lust, greed and selfishness are burned away. Purgatory is a place of progress, not simply a place of peace. When we pray for our loved ones on All Souls’ Day and throughout the month of November, we should be praying in an active way, not only that they will find peace, but that they will grow up into the full stature of Christ Jesus and rapidly rid themselves of every weight that holds them back — so they might become the radiant images of Christ they were created to be. The work of becoming a saint is easier here than it is in purgatory. All of us still have plenty of work to do as we cooperate with God’s grace in the great adventure of sanctity. This work requires a courageous and joyful spirit. It requires discipline and the spirit of the warrior. Father Dwight Longenecker’s latest book, The Romance of Religion, will be published in February 2014 by Thomas Nelson. Visit his blog, browse his books and be in touch at DwightLongenecker.com.